Dimensions 36'2" by 28'1" by 12'6"
Power plant One 340 hp (254 kW) Hitachi Tempu 12 nine-cylinder air-cooled radial engine driving a two-bladed wooden propeller. The Glen was designed specifically to be a submarine-borne reconnaissance seaplane, with floats and wings that were easily detached for stowage. It was the only type of manned aircraft to ever drop bombs on the American mainland, when a Glen from I-25 dropped four phosphorus bombs along the Oregon coast in an attempt to set the forests on fire. 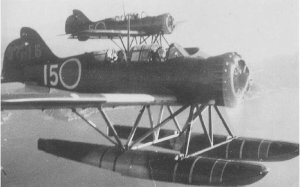 The aircraft also performed the Japanese damage assessment following the Pearl Harbor strike, and performed similar reconnaissance duties over other Allied ports until increased use of radar made such sorties impossible. The prototype was completed in 1939 and went into production in 1941 after successfully winning its design competition against the Watanabe E14W. The Pearl Harbor reconnaissance mission was its operational debut. The aircraft was handicapped by its inability to operate in any kind of rough seas. It also had miserable performance, making its early penetrations of Allied air space all the more remarkable.